Clusters of deep-purple pods filled with delectable green peas. Cook's Garden Favorite. Our Fordhook visitors can’t resist the lure of these edible purple garden ornaments. Heirloom’s fragrant purple-pink flowers are followed by clusters of deep-purple pods filled with delectable green peas. Best used as a shelling pea, to be cooked or dried, you will enjoy the fresh pods when young and tender. Strong, climbing vines thrive in well-drained, well-watered, limy soil. 55-60 days. Learn all about growing fresh garden peas – including the three types of peas. Pole beans and peas grow best on supports. This tower grows more beans and peas in a smaller area. Because peas are members of the legume family of plants, they can benefit from an application of a soil inoculant designed for beans and peas, prior to planting. The inoculant will enable the plants to take nitrogen from the air to use as fertilizer, which can increase crop yield and quality. Coat untreated seed with an inoculant. Sow in average soil in full sun in early spring for first crop, in late summer for fall crop. Support shorter peas on small stakes or a pea fence. 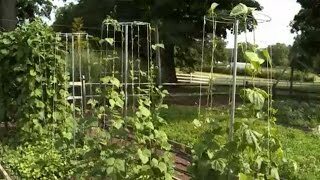 Taller peas can be supported with a tower or trellis netting. Set supports for vining varieties prior to planting. Sow 2 inches apart in double rows spaced 6 inches apart with 24 inches between each set of rows. Cover with 1 inch of fine soil, and sow 1 inch deep. Seedlings emerge in 7-14 days, possibly longer in cooler soils. Thin gradually to stand 4-6 inches apart starting when seedlings are about 1-2 inches high. Keep plants well watered during dry periods to promote rapid, uninterrupted growth. They do not perform well in overly wet conditions. Seeds can rot in wet soil before germination occurs when planted in early spring. To determine when to pick shell peas, check the pods by eye and feel. If the pea pod is round, has a nice sheen, and is bright green, it is ready. If the seeds have made ridges on the pod and the pods are dull green, it is past prime. 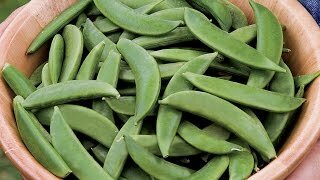 You can pick snap and snow peas at any time but they are tastiest when the pods still have some play around the peas when you squeeze the pods. Pick snow peas before the peas start to enlarge. If harvest exceeds immediate fresh use, you can freeze peas immediately after harvest to retain rich flavor. Blanch peas for two minutes in boiling water, drain, and then plunge into ice cold water for another two minutes. Drain again and loosely pack the peas into plastic freezer bags or containers. Use within 9 months for best quality. Peas can also be dried in a dehydrator and stored in a sealed canister for use in soups and stews. Pea, Purple Podded is rated 2.8 out of 5 by 4. Rated 2 out of 5 by PeaDevil from Looks great, tastes bland These grew beautifully!!... Then I tried one... Very disappointing taste! Quite bland and didn't really taste like anything I'd want to eat. Tried cooking them too, no dice. Rated 2 out of 5 by Avalyn from Super fun...but lacking in flavor These grow well and quickly! They are gorgeous plants with the fuschia flowers and produce prolifically. The flavor, however, leaves a lot to be desired. They have an almost bitter aftertaste. I really wanted to love these...but we ended up throwing most of the peas in the garbage because we just couldn't force ourselves to eat them. Rated 2 out of 5 by Zack from Purple peas While these peas are very prolific and pretty there are not at all good tasting. Whereas my standard peas were very sweet. Rated 5 out of 5 by Za Jackel from Excellent choice in peas! Anyone can grow these, they don't really need fertilizer as they make their own nitrogen and will grow rapidly in most any soil.